Troops Who Sought Strike Thought Taliban Had Hospital!!! Strikes on hospitals are forbidden for all armies of the world! But not for American army! But not for Nazis' army during WWII.. Of course they knew what they're doing! WASHINGTON (AP) — The Army Green Berets who requested the Oct. 3 airstrike on the Doctors without Borders trauma center in Afghanistan were aware it was a functioning hospital but believed it was under Taliban control, The Associated Press has learned. Separately, in the days before the attack, "an official in Washington" asked Doctors without Borders "whether our hospital had a large group of Taliban fighters in it," spokesman Tim Shenk said in an email. "We replied that this was not the case. We also stated that we were very clear with both sides to the conflict about the need to respect medical structures." Taken together, the revelations add to the growing possibility that U.S. forces destroyed what they knew was a functioning hospital, which would be a violation of the international rules of war. The Pentagon has said Americans would never have intentionally fired on a medical facility, and it's unclear why the Green Beret unit requested the strike — and how such an attack was approved by the chain of command — on coordinates widely known to have included a hospital. Even if the U.S. believed the Taliban were operating from the hospital, the presence of wounded patients inside would have made an air attack on it problematic under standard American rules of engagement and the international law of war. Pentagon spokesman Maj. Roger Cabiness declined to answer questions, saying in a statement that it would be "premature to draw any conclusions" before the three investigations into the attack are complete. The U.S. has determined "that the reports of civilian casualties were credible, and we continue to work with the government of Afghanistan to fully identify the victims," said Brig. Gen. Wilson Shoffner, a NATO spokesman, in a statement. U.S. and NATO investigations, he said, "continue to look at a series of potential human errors, failures of process and technical malfunctions that may have contributed to the mistaken strike on the hospital." "MSF report that they have personnel in the trauma center," the Oct. 2 report by a senior Green Beret officer from 3rd Special Forces Group said, according to two people who have seen it. MSF is the abbreviation for the group's French name, Medicins sans Frontiers. The report adds that the trauma center was under the control of insurgents, said the sources, who would not be quoted by name because they were not authorized to discuss it publicly. The coordinates of the hospital were sent to "all friendly forces," the report said, noting that among the U.S. objectives for the next day was to "clear the trauma center" of enemy forces. Doctors without Borders officials say the hospital was not under Taliban control and that no gunmen were operating from within the compound — about six city blocks square with the one-story hospital situated some two blocks back behind a 12-foot wall — when the AC-130 gunship made five passes, firing for an hour. Another hospital run by Afghanistan's health ministry, a short distance away, had been overrun by the Taliban when insurgents seized the city, a senior U.S. defense official said. The new information raises the possibility that some elements of the U.S. intelligence and military apparatus had confused the two hospitals. But other evidence argues against such confusion. The AP has reported that American special operations analysts were gathering intelligence on the Doctors without Borders hospital, including indications it was being used by a Pakistani operative to coordinate Taliban activity. The intelligence gathering occurred as the U.S. was supporting the Afghan effort to retake Kunduz, which included heavy fighting by Green Berets. The analysts' dossier included maps with the hospital circled, along with indications that intelligence agencies were tracking the location of the Pakistani operative and activity reports based on overhead surveillance, according to a former intelligence official who is familiar with some of the documents. The intelligence suggested the hospital was being used as a Taliban command and control center and may have housed heavy weapons. After the attack, some U.S. analysts assessed it was justified, the records show, and one report said 16 enemies had been killed, the two sources say. Those deaths were said to include the Pakistani, who the U.S. believed was working for his country's Inter-Service Intelligence directorate. No evidence has surfaced publicly suggesting a Pakistani died in the attack, and Doctors without Borders says none of its staff was Pakistani. Gen. John Campbell, commander of American forces in Afghanistan, has said that "a special operations unit that was in close vicinity ... was talking to the aircraft that delivered those fires." A senior Green Beret officer has told superiors that his troops, accompanying Afghan security forces, were under fire and in danger, according to a former government official familiar with his account. 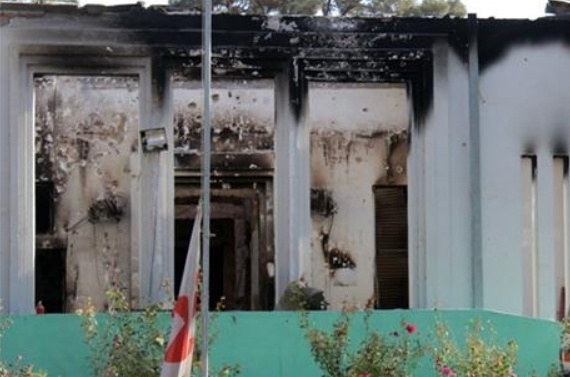 Doctors without Borders denies that any fire was coming from its compound. And even if it was, it's unclear why any U.S. forces outside those walls could not have moved to safer ground. Also a mystery is why the AC-130 gunship would have kept firing during the course of an hour on a building that both the Air Force and the Army knew was an internationally run trauma center. To avoid civilian casualties, a gunship would typically stop firing as soon as it achieved its objective — in this case, ostensibly, protecting U.S. forces. Generally, the aircraft would require further clearance from the troops on the ground to continue firing. An AC-130 gunship flies low and slow, often with a good view of its target and the damage it is inflicting. The pilot also would have had to know the locations of U.S. and allied forces in the area, to avoid hitting them. Doctors without Borders has said it was frantically calling Kabul and Washington during the attack, trying to make the U.S. aware of what was unfolding as patients died in their beds. Presumably, the gun camera video from the plane would show whether anyone was firing from the hospital. The U.S. government has yet to make it public. Associated Press writer Lynne O'Donnell contributed to this report from Kabul.